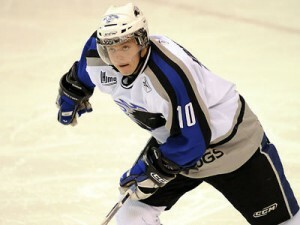 Michael Kirkpatrick of the Saint John Sea Dogs has quietly become one of the QMJHL's most consistent scorers. There were some big match-ups this weekend in the Canadian Hockey League. The first, and the one I was most excited about, was Saturday night’s main event in the Quebec Major Junior Hockey League when the Saint John Sea Dogs and Moncton Wildcats had to go to the shootout to decide who the winner would be. Saint John prevailed 5-4, with Michael Kirkpatrick leading the way with a goal and two assists. He might not be the biggest name on the Sea Dogs roster, but Kirkpatrick been a consistent scorer all season and as an alternate captain is clearly revered in Saint John’s locker room. Also, you’ll be happy to note that I refrained from calling this game the Battle of New Brunswick. Cliché dodged! That same night the Western Hockey League saw an even closer rivalry, as the Saskatoon Blades and Brandon Wheat Kings locked horns. Again, the game went to extra time with Saskatoon edging Brandon 4-3 in overtime. With the win the Blades moved into first place in the WHL’s Eastern Conference, even though the Wheat Kings have picked up points in their last eight games. And, as predicted in this very space the Calgary Hitmen have moved into second in the Conference. The other notable game this weekend was also in the WHL, with the Prince George Cougars hosting the Edmonton Oil Kings Friday night. In the battle of the two worst records in the league, Prince George came out on top 4-1, snapping their 13-game losing streak. Never fear Edmonton hockey fans, the Oil Kings won the rubber match on Saturday, taming the Cougars 5-2. Sunday was a pretty light day with four games in the Ontario Hockey League and just one in the QMJHL. Most significantly, Adam Comrie kept the Guelph Storm's playoff hopes alive with goals that sparked a 4-3 win over the Ottawa 67's. Apparently there was some sort of football game that evening that the hockey leagues didn't want to compete against. The Victoriaville Tigres struck a blow in the Quebec Major Junior Hockey League's standings Friday night. Cody Lindsay did it at both ends of the ice Friday night. All the Prince George Cougars needed was a visit from the Edmonton Oil Kings. The two best teams in the Quebec Major Junior Hockey League needed the shootout to decide a winner on Saturday night. It's been a big week for Greg McKegg. The Swift Current Broncos made a statement with their win Saturday night. Defenceman Adam Comrie stepped up in front of his hometown crowd to keep his Guelph Storm in the playoff picture.